For those that find the stock M4 not quite aggressive enough. 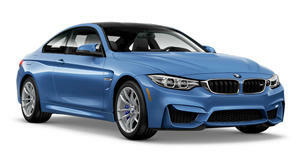 Thanks to BMW Abu Dhabi Motors, here’s a first look at the brand new M4 fully loaded with M Performance goodies. The most obvious upgrades are the M stripes and carbon-fiber aero kit including a front splitter, intake grilles, side skirts and trunk-mounted spoiler. Carbon-fiber rear diffuser, quad tailpipes, roof and mirror covers and a set of 19-inch gloss black M double-spoke alloys housing gold calipers are other noteworthy mods. Inside, the cabin sports an Alcantara-wrapped three-spoke steering wheel and a digital display.